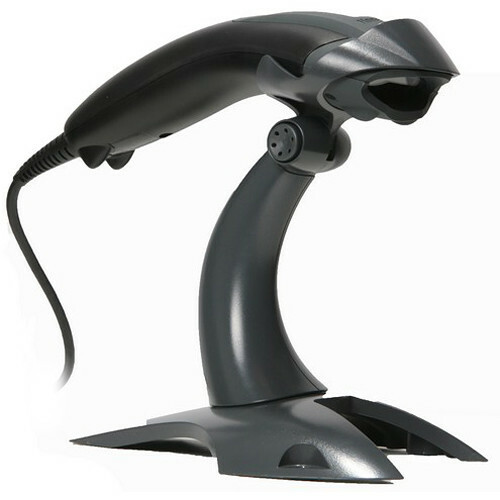 Typical Read Range: 1 to 14"
Capable of reading linear barcodes such as PDF417 as well as 2D symbols, the Voyager 1400G Handheld Scanner from Honeywell is a versatile corded scanner well-suited to a business or office environment. It features a lightweight design, weighing only 4.2 oz, and can resist drops from up to 4.9'. Using a 640 x 480 scan pattern to detect barcodes, the Voyager 1400G offers a typical reading range from 1 to 14". Its field of view is 37.8° horizontally and 28.9° vertically, and the scanner works with plain printed barcodes as well as mobile phones and other types of screens. Interfaces for connection include USB, keyboard wedge, and RS232, and the unit also works with IBM 46xx point-of-service terminals via RS485. Uses a 640 x 480 pixel array pattern, featuring a field of view of 37.8° H / 28.9° V and a typical read range of 1 to 14"